I just spoke to JC Lee, the daughter of Stan Lee and Joan Lee, in the bath. Or rather she was in the bath, I wasn’t, and it was on the phone. But there were no time to fuss over protocol — everyone was getting ready, as Stan Lee had a show to do. He was about to be picked up to fly out to the Silicon Valley Comic Con, founded by Steve Wozniak, where Stan will be appearing this weekend. 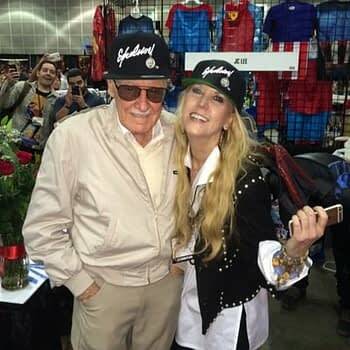 Famed for travelling the world, signing autographs, and taking photos with fans, this is Stan Lee’s first show for some time, as he cancelled a number of appearances earlier in the year. This was blamed on suffering from pneumonia but also coincided with a number of articles in the press regarding allegations of harassment, issues with management, and other people tasked with his care. Who exactly is in the right and the wrong is still very unclear, but no charges appear to have been filed, and the situation is very much up in the air. I was also the first reporter JC had spoken to since those events. Apparently she doesn’t often answer her phone to an unknown number, but, as I mentioned before, I caught her in the bath. From the top without me saying anything, she wanted to assure people that she was fine and that Stan was fine. She talked about the privacy of her family — that her father and family lived a private life, but press attention had changed all that. She condemned what she called the “haters and creeps coming out of the woodwork” and those who “had robbed them of that privacy”. Her admiration for her father was apparent in every syllable, denying any allegations against him, calling him a “stellar, stand-up, gorgeous man” and describing him as lucid as ever despite his years. We also talked about her late mother Joan and how she wouldn’t have let anything like this happen. Concern had been expressed that Stan was being kept from his friends and colleagues. JC wanted to refute that, saying that he has a phone with him at all times that he can use to call anyone, and that no one tells her father what he can or can’t do — he is too strong-willed for that. She says he is always in charge, and that was true now as it was then, of the artists and writers who worked for him. As for issues regarding the controversial “blood signature” comics, she said she did recall that being discussed at the time, and also expressed this was in the context of the KISS comic book that had blood from the band members added to the print run. However, when she heard the recent news, she was surprised. As part of the Hand of Respect organisation, her printed signature is on the authentication certificate, but said she didn’t know anything about any of this — she was not in the loop and didn’t feel able to comment on that or why charges had not been brought against those involved. It may be an important lesson. Stan Lee will be appearing at Silicon Valley Comic Con this weekend.